Hey Kids! Frogs come in all the colors of the rainbow! 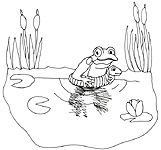 Here's some frog pictures for you to color however you want! This will bring up a larger image which you can print to color. To do this, choose "print" from your menu bar to print out the picture. Hit the "Back" Button on your browser to return here. in the Valentine's Day Fun page! 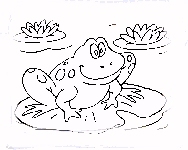 PC users can download a .BMP files to color on your computer here. You can look at pictures of other cool frogs in the Frog Art Gallery.